Here are a few tips on choosing a hairstyle that will compliment your wedding gown. If you're going to wear a strapless gown or a gown with a sweetheart neckline and you're worried about showing off too much skin, your hair can be worn down in curls and dressed up with hair accessories such as hair fasteners and combs. Adding accessories to your do will emphasize your look and will also look absolutely beautiful in pictures. If your style is going to be casual/bohemian: wearing your hair up or down will work. The trick is to style your hair using loose curls. 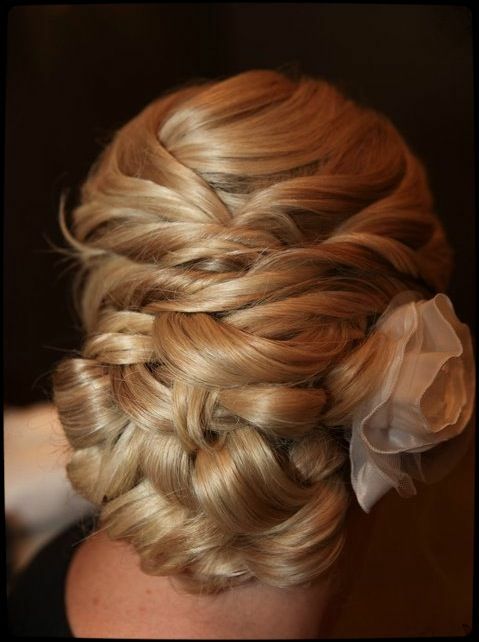 Add some fishtail braids such as the one below to complete the look. Hilary Duff on her big day! If you're wearing a vintage inspired gown... pin up styles such as the ones below will work well. Don't forget to accessorize...accessorize...accessorize! Such a neat, beautiful and sophisticated do! Don't forget the brooch! Tell us which look you'll be wearing on your special day. Newer PostIs a Custom Tailored Wedding Gown right for you? ?